SearchReSearch: Answer: Is this a safe treatment for caries? ... is to develop some skills that are useful in general. You know, real skills for real problems. In medicine, new treatments and therapies come to market every so often, and many people wonder--is this good for me? Does this actually work? What are the risks and benefits? In general, how do you evaluate these things? This week we consider the dental treatment SDF (Silver Diamine Fluoride). It's a simple, low-cost way to treat teeth with a coating that not only prevents future cavities (caries), but also seems able to reverse the damage in some existing cavities. "Silver diamine fluoride (SDF) is a topical medication used to slow down or stop dental decay in both primary and permanent teeth. ... When applied to a tooth with a cavity, SDF hardens the softened tooth structure, turning the damaged portion of the tooth black in color." That's from the California Dental Association (the CDA, which I happen to know is a reputable information provider). But true to my skeptical nature, I double checked: the CDA has been around since 1870 and has a great record of being both a philanthropic organization and a provider of information about dentistry in general. "SDF is a conservative approach to managing dental decay and can be used on teeth where there is no pain or discomfort. It is particularly useful for providing dental care to individuals who present challenges to receiving traditional treatment because of their age, behavioral issues, or medical conditions." 2. Found several fact sheets about SDF by various community dental programs. (Little Pearls dentistry for kids; America Academy for Pediatric Dentistry and others. They all agree--SDF is great for kids because there's no pain, just a gentle painting of the teeth with a microbrush. 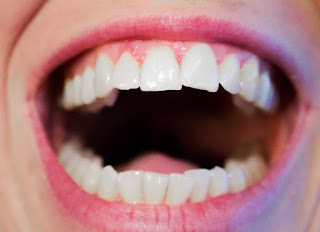 Some parts of the teeth do turn black, but only the parts that already have cavities. As they point out, "that's how you know it's working!" They correctly point out that inner cavities and difficult to reach cavities are probably not a concern, and visible caries need some other kind of treatment. 3. A paper from the American Dental Association on Guidelines for SDF treatment of pediatric and special needs patients. They're more cautious, but point out that SDF works exceptionally well for pediatric and special needs patients (who might have difficulty brushing their own teeth), but that the results are so intriguing that they're going to do additional research. 4. But in another paper, A systematic review of silver diamine fluoride: Effectiveness and application in older adults. This is another study of another kind of cavity, this time in older adults. The results are amazingly good--the effectiveness is incredibly high, and no adverse side-effects were noted. and found nothing of consequence. Everyone noted the staining (and in particular, that if you get it on the patients tongue, they'll have a black mark that will last for a week or so... but it's painless and goes away quickly). Overall I read about 5 papers from very different sources (some very technical, from highly regarded journals) and another 10 or so summaries for patients by different dentists who use SDF. I admit I was slightly skeptical about this universal acclaim, but then I looked up the cost of the standard SDF medicine that the dentists use. It's $100/bottle. Each bottle has around 250 drops, or around 40¢/drop. Each drop treats around 5 teeth. You can do the math... that's 8 cents / tooth: Nobody is making any money on this. It just looks like a very effective, very cheap therapy for dental cavities. Oddly enough, I actually had to visit my dentist this week and when I asked her about SDF she too was concerned about potential blackening, but "otherwise it sounds great for kids!" (She also asked if I was studying dentistry... Apparently few people ask about SDF. If I were a vampire, I'd worry about the number of cavities caused by an all-blood diet. I know that the Maasai of the African veldt have a large amount of cow blood and milk in their diet, and surprisingly, they have very low rates of dental cavities. 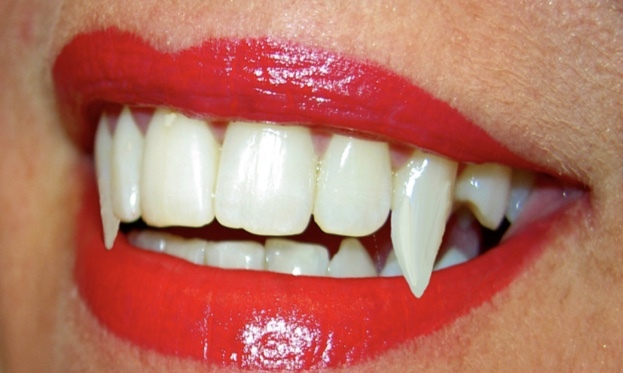 But if very modern vampires (who might consume larger amounts of sugar in their diets) are concerned about caries on their fangs, then SDF might be just the ticket. And if they happen to turn black, then so much the better, eh? "Silver diamine fluoride is an inexpensive topical medicament used extensively in other countries to treat dental caries across the age spectrum. No other intervention approaches the ease of application and efficacy. Multiple randomized clinical trials – with hundreds of patients each – support use for caries treatment, thus substantiating an intervention that addresses an unmet need in American dentistry. In August 2014 the Food and Drug Administration (FDA) cleared the first silver diamine fluoride product for market, and as of April 2015 that product is available." Although I spent a fair bit of time looking for side-effects and adverse side effects (my searches also included the fancy medical term "contraindications," I just didn't find anything. So.. would I use this for me and my family? Yes, although probably not on the front teeth!